The Webley revolver in it’s break action form is one of the best revolvers ever made – at least in my book. That being said, perhaps only someone of British extraction would make a claim such as that, and I qualify there both in birthright and in having a bit of a penchant for Romeo Y Julieta cigars of the “Churchill” variety. When Winston Churchill was on the run from the Boers he was helped by a family who provide him with the essentials of life for a Brit; food, whiskey, and a revolver. Perhaps they were out of Cuban cigars; wars have an unfortunate tendency to play havoc with the supply of such modest essentials of life. Famous Brits who carried Webley revolvers of course include both Sherlock Holmes and Doctor Watson. Holmes his trusty Webley R.I.C. (possibly a gift from a grateful Inspector Lestrade) and Watson his service revolver kept after his time in the war in Afghanistan. There is also possibly a famous American; General George Custer is reputed to have been presented with one by Lord Berkeley in 1869 and may well have been using it at the Battle of Little Bighorn in 1876. 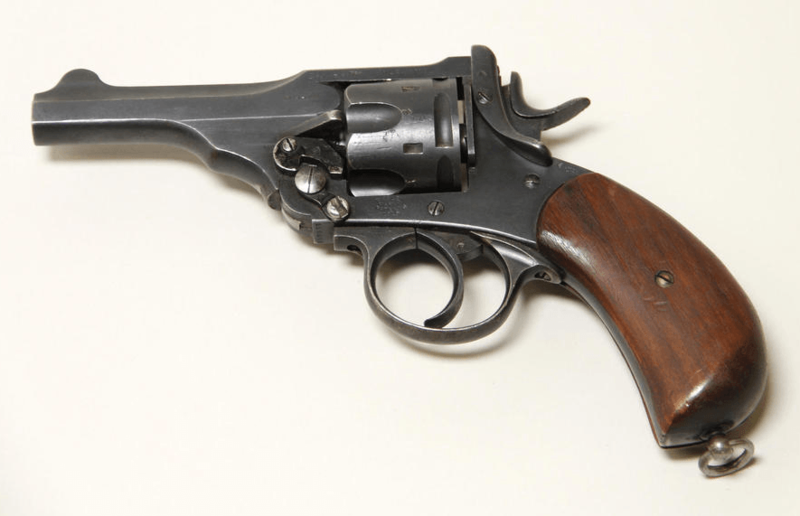 The Webley R.I.C. or “Royal Irish Constabulary” revolver of the sort Sherlock Holmes is reputed to have carried, and which also may be the revolver carried by General George Armstrong Custer at the Battle of the Little Bighorn. The hinge action Webleys begin with the Mark I and proceed with little change to the Mark VI. Marks 1 through to V have a characteristic “Birds Beak” grip which allows a very straight grip angle. The Mark VI changes this to a more upright grip with a notch as we find on Smith and Wesson revolvers even today. 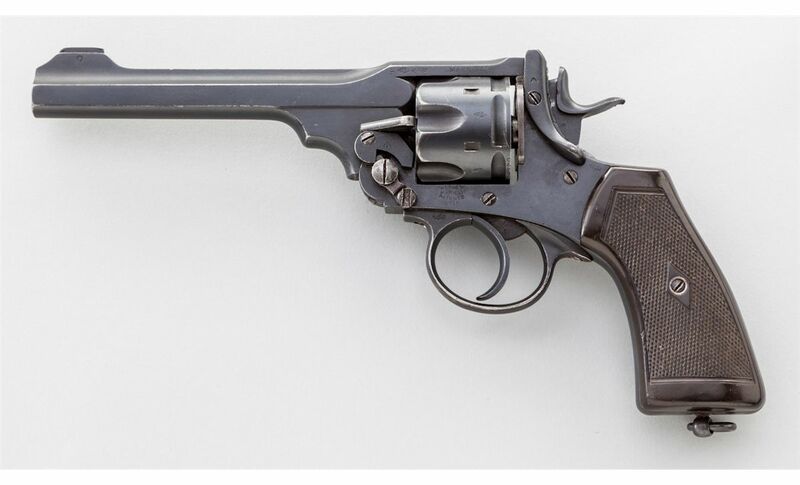 Interestingly, prior to the production of the Mark VI revolver, Webley were manufacturing an almost identical revolver for the Wilkinson Sword Company. Finish of the Wilkinson Sword Webleys was of the highest standard. This was probably the inspiration for the changes we see between the Mark V and the Mark VI. Having had the opportunity to handle but not actually shoot both versions I would tend to favor the Mark V and the earlier “Bird’s Beak” styles. I like a straight wrist grip on a revolver so, as long as the grip can be kept consistent from shot to shot without slip induced by recoil, it is for me at least preferred. A .455 Webley like a 45ACP produces fairly robust recoil but nowhere in the .44 Magnum league so I think it would be fine, just as the grip on a Colt Single Action is fine. 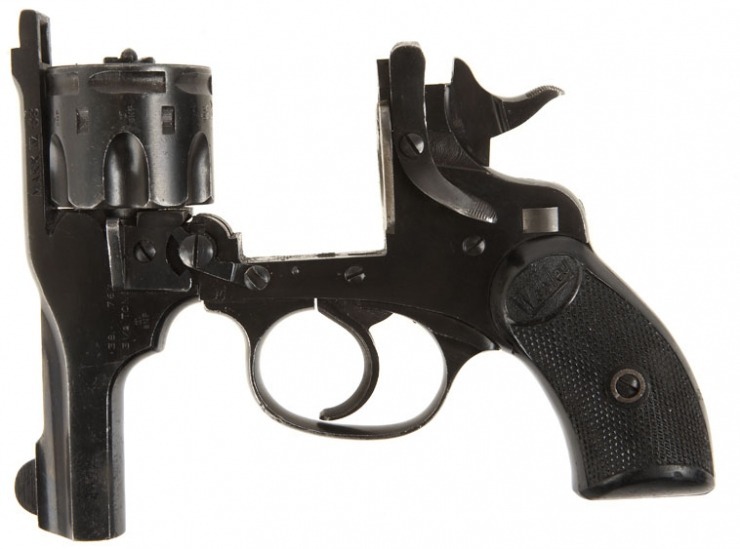 The revolver in our featured image is a Webley MkV revolver for sale from Bonhams. It has been converted from .455 Webley to .45ACP (with full moon or half moon clips) so this revolver is a shooter. I have not had the opportunity to examine the revolver but it is normal for conversions of this type to accept .45 Auto Rim cartridges also. So its a shooter and a very affordable one. This is a revolver with which to turn up to an IPSC revolver match so you can show them what might be called “British speed loading”. Well, sort of. I think the military users of this revolver may well have been grateful for full moon clips for reloading when things were “a bit sticky”. WW Greener in his book suggests that if six shots are not sufficient to dispel the emergency then perhaps the time could be better spent than attempting to reload. I think I disagree. I think that if six shots were not sufficient to dispel the emergency then I would be wanting to get another six cartridges into that revolver just as quickly as my trembling fingers would allow so I could keep on shooting whilst I still had breath. The break action Webley revolvers have a reputation for closing “like a bank vault door” and for solid, reliable action. Be aware though that standard 45ACP loads or 45 Auto Rim actually generate more chamber pressure than the proof loads for these revolvers. The operating pressure for the Webley .455 revolvers was 13,200psi. GI .45ACP are around 19,000psi. So, to remain safe one needs to reload one’s own ammunition using reloading data for the .455 Webley, and stick with cast bullets. To state the obvious, please don’t consider trying .45ACP +P in this old revolver. It might stand up to it, perhaps for a few shots, and then again it might not. I’ve only witnessed two “blow ups” on ranges in my over two decades of shooting. In those two cases no-one was injured, thankfully, but they came a tad too close to comfort to losing useful pieces of their anatomy. Stick with modest standard .455 Webley loads and enjoy being able to shoot a wonderful piece of history. Perhaps you might just win a competition with it in the process. One good starting point for finding such loading information is Frank C Barnes “Cartridges of the World”. 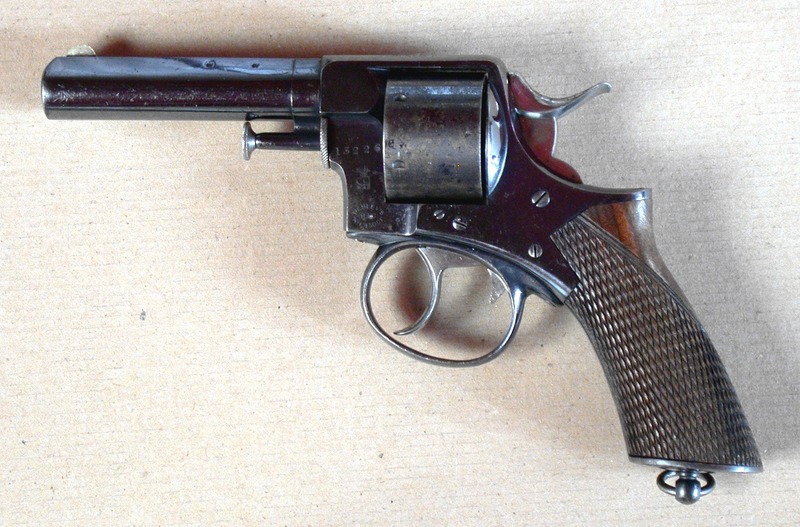 Webley break action revolver in the open position. Reloading doesn’t get more accessible than this! (picture courtesy of deactivated-guns.co.uk).